I snapped this little fella today whilst sitting outside enjoying some sunshine on my bones. I think the only reason he let me get so close, was that there was another one not far away and he must be have had his eye on her. Every time I got too close and he flew away, he would come back to this stick. So I am sure this is a male and he had his eye on the prize. Why else would he put himself in danger? As a side note. Why is this stick there? Well I came up with an idea last year that whenever our little dogs do there business and we are not in that part of the garden playing with kids or whatever, then I mark the area with a stick. I let the sun beat down on it, which dries it out, which ultimately makes it easier to pick up. OK our dogs are 3 LBS and 7LBS, so we are not talking about a lot of mess here but works well. And stick served 2 purposes today. Thought I would share that with you. :-). Beautiful image, Ken. Be glad your dogs are so small; mine are 50lbs. and 80 lbs. There’s always something to be grateful for, right? It’s a nice shot ! 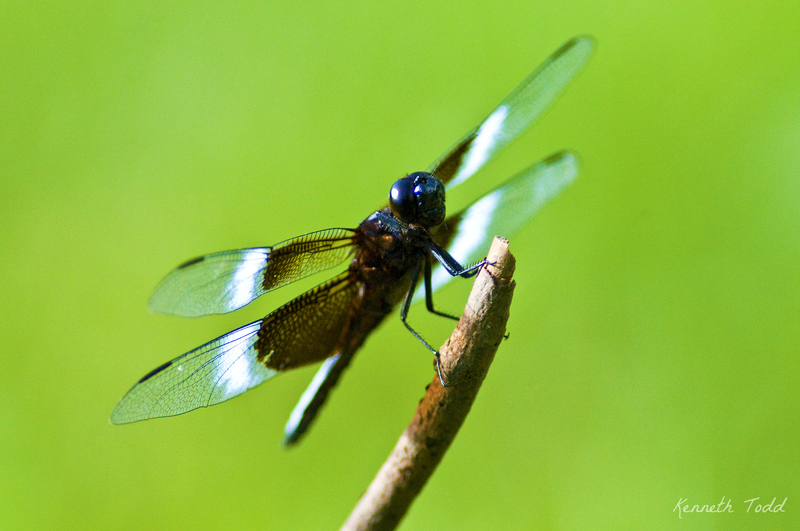 I adore dragonflies. Saw an azure blue and purple one in Italy last month but by the time I grabbed my camera, he buzzed off. What a great shot and what a nice marker! Lol.